In the restoration field the synthetic resins are commonly used and they are selected in order to replace natural products and possibly overcome their drawbacks. Nevertheless, these resins are not completely able to cover the specific mechanical properties required in each restoration work. 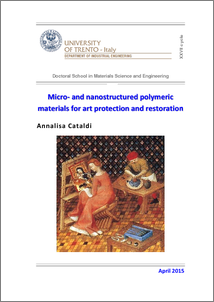 The main aim of this research is the development of innovative micro/nanocomposite materials with enhanced features for artwork conservation operations. The introduction of appropriate amounts of micro- and nanofillers within commercially available art preserving polymers may allow the improvement of their mechanical deficiencies, without impairing their physical and chemical properties. Cellulose microcrystals (CMC) and nanocrystals (CNC) were selected as natural reinforcing fillers for a commercial acrylic copolymer (Paraloid B72) widely applied as a consolidant of wooden objects and two molecular weights of a thermoplastic water soluble adhesive used in the restoration of oil paintings (Aquazol 200 and 500). In particular, melt-compounded Paraloid and Aquazol based microcomposites with various amounts (5÷30 wt%) of CMC and thin films of Aquazol 500 micro- and nanocomposites produced by the solution mixing method with a CMC and CNC content of 5-10-30 wt% were investigated. Several characterization techniques were used in order to assess the effect of micro- and nanocellulose on the physical and thermo-mechanical behavior of these three thermoplastic polymers. In the first part of the work, the characterization of melt-compounded and compression molded microcomposites under dry and conditioned state (T= 23°C, RH= 55%) was performed. All dried and wet formulations showed a similar stabilizing effect of CMC flakes with an increase of elastic modulus and a decrease of thermal expansion coefficient and creep compliance, regardless of the moisture content. Interestingly, conditioned composites exhibited the enhancement of the tensile properties at break, in contrast to dried microcomposites that reported a drop in these properties. On the other hand, the highest amount of CMC led to a chromatic change of the three matrices towards yellow-brown tones. In the second part of the work, the characterization of solution mixed micro and nanocomposites based on Aquazol 500 highlighted the systematic increment of the dimensional stability of the neat resin due to the presence of both CMC and CNC particles. Remarkably, CNC proved to be more effective than CMC in increasing of the stiffness and the elongation at break of Aquazol as the filler loading increased, without impairing the good optical properties of this material. In the third part of the work, the application of melt-compounded Paraloid/CMC composites as consolidants for damaged wood was investigated. CMC introduction did not change the good viscosity of the neat matrix and especially its good water repellency. Wood samples treated with microfilled Paraloid exhibited an increment of the stiffness and the flexure strength under quasi-static and impact conditions and, additionally, a systematic enhancement of the radial and tangential surface hardness almost up to the intact wood values was observed. In the last part of this thesis, the practical application of CMC and CNC Aquazol based adhesive films made by melt-compounding and solution mixing was investigated for the lining of oil paintings. Single-lap shear tests confirmed the stabilization action of both CMC and CNC particles on all experimental formulations with a progressive reduction of the compliance proportionally to the filler loading. Even in this case the increment of the Aquazol dimensional stability was mainly imparted by the presence of CNC. Only for solution mixed CMC composites a dramatic drop in the adhesive strength as the filler content increased was detected.